Swiss Style Now, a traveling exhibition opening on September 6 in the 41 Cooper Gallery, considers how one of the most celebrated and recognizable graphic styles has evolved into its current form. Historically, its modernist values ushered in an an era of straightforward visual and graphic thinking. “Swiss Style Now” includes works by Swiss designers from the past five years. 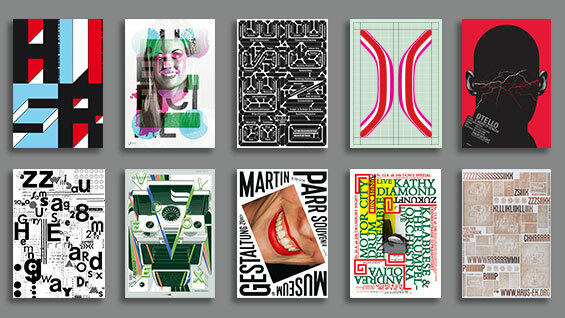 Its curators are Swiss graphic designers themselves, including Erich Brechbühl and Noël Leu, and design educators such as Alexander Tochilovsky A’00, associate professor at The School of Art, and Xavier Erni, who teaches graphic design at the University of Art and Design and co-founded the studio Neo Neo. We spoke to Erni and Tochilovsky, who is also curator of The Herb Lubalin Study Center of Design and Typography, in advance of the exhibition opening. What is the historical relevance of Swiss Design? Tochilovsky: The Swiss Style of graphic design of the 1950s and 1960s was born during a boom of industrialization when there was a need for a simple visual language that could be understood by many within international trades. These pioneering designers ushered in a new way of visual thinking, emphasizing a clear message in the most objective way. They also crafted a more calculated and rational way of thinking about setting type, with an emphasis on mathematical grids to organize complex information. The style became a hallmark of efficient communication that could easily be applied to a variety of design problems. Truly transcending cultures and borders with its clean, impersonal style, it become known as the International Typographic Style. The aesthetic is still visible within the realm of graphic design. What makes this style so recognizable? Tochilovsky: This is how Josef Muller-Brockmann, one of its icons, described it: “...[it] sought an absolute and universal form of graphic expression through objective and impersonal presentation, communicating to the audience without the interference of the designer’s subjective feelings or propagandist techniques of persuasion.” From a formal approach, the most recognizable features are its minimalist aesthetic, simple and direct messages, the use of sans-serif typefaces, use of photos instead of illustrations, and construction of grid-based layouts. Why an exhibition now of current Swiss designers? Erni: The Swiss Style is probably one of the most famous models of graphic design since the 1950s. It was very relevant during the post-war era of industrialization. But times and advertising have changed. The minimalism, the strict and serious grid systems may influence contemporary Swiss designers, but Swiss Style today has loosened up. Living in the internet era, there’s access to millions of images of graphic design projects from all over the world, and that creates new international trends. Can we still talk about graphic styles referring to a country; can we still talk about a Swiss Style? We won't try to answer or define it. Our aim is to offer New Yorkers an opportunity to look at more than 150 printed objects of contemporary Swiss graphic design. Visitors can make their own ideas of what they consider Swiss Style today. Why only work from the past five years? Erni: One year would have felt too short; we wouldn't have been able to show some important pieces. Ten years would have been too long, bringing too many pieces into the exhibition. Five felt just right for an overview of the new directions within Swiss design community. Is there anything different about the current designers than what is typically considered the Swiss Style? Erni: In an almost direct opposition to the approach of Mr. Brockmann and his contemporaries, graphic design is now is full of personal taste and emotions. Humor and subversion can now also be part of the game. It is much more diverse, emotional and fun. What is most special to you about this generation of designers? Erni: Probably the diversity of aesthetic, and ways to express things even if trends play a prominent role. The return to craftsmanship is also important today for many of the Swiss designers. Printed matter is still one of the favorite mediums to work in, and printing experiments are becoming more and more a part of the process. Designers are still really attached to the finer details. How is this exhibition different from earlier ones? Tochilovsky: It has been updated with projects from the past two years, and more designers have been invited to participate. A typeface design section will be included. An overview of the historical artifacts showcasing the classic Swiss Style, pulled from the archives of the Lubalin Center, will also be on view in an adjacent space. Why bring the exhibition to the United States and The Cooper Union? Erni: There is a long-standing relationship between Switzerland and New York. Our national icons—Herbert Matter, Emil Ruder and Armin Hoffman—all came to the United States and New York for a period of time. Modernism had an important role in forming the New York aesthetic. The Swiss may have a different education and culture, but there is an understanding between the countries from a graphic design point of view. The Herb Lubalin Study Center and Cooper have important graphic design roots. The archive is full of impressive historical pieces (many from Switzerland!) and thanks to Alexander’s knowledge, it’s one of the best places for us to collaborate with in the city. I met him last year when I was in Manhattan for an artistic residency with Noël Leu—one of our other co-curators—and that’s when we began planning this collaboration!